Moore Insurance, an eastern Texas firm that provides families and business owners in the Houston area with access to asset protection and financial planning services, is teaming up with the For A Day Foundation for a regional charity event aimed at improving the lives of children with cancer and other chronic diseases. 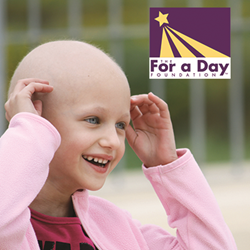 The For A Day Foundation assists children facing deadly and debilitating diseases by providing emotionally therapeutic experiences that reduce stress and improve healing. Through their Queen for a Day & Hero for a Day programs, For A Day gives families the opportunity to spend as much quality time together as possible in settings free of medical equipment, doctors, or hospital routines. “Having a sick or injured child is heartbreaking, and spending time away from the hospital improves outcomes and raises spirits for both hospitalized children and their families,” says Jared Moore executive manager and owner of Moore Insurance. Moore and his team are building up support from like-minded families, medical practitioners, and business associates throughout the Houston area by sharing information on the For A Day charity event over social media and mail channels. Additionally, the Moore Insurance online magazine, “Our Hometown,” will soon be featuring a full length article discussing the goals charity drive in an effort to bring in even more local support: http://mooreinsuranceteam.com/Our-Hometown-Magazine_39. Moore Insurance has worked directly with nearly two dozen charities, nonprofits, and public service foundations in and around Houston since early 2015. As longstanding affiliates of the nationwide “Agents of Change” charity support coalition, the Moore team plans to work with a new eastern Texas charity every 60 days. All readers who would like to join the For A Day Foundation and the Moore Insurance team during this charity drive are encouraged to help improve outcomes for chronically ill children by following this link: http://mooreinsuranceteam.com/Smiles-for-Our-Little-Queens-and-Superheroes_28_community_cause. The full roster of charitable organization previously assisted by Moore Insurance can be found in the agency’s Community Causes archive: http://mooreinsuranceteam.com/community-cause. As a Personal Finance Representative in The Woodlands, agency owner Jared Moore knows many local families. His knowledge and understanding of the people in his community ensures that clients of Moore Insurance are provided with an outstanding level of service. Jared and his team look forward to helping families protect the things that are most important - family, home, car and more. Moore Insurance also offers clients a preparation strategy for achieving their financial goals. To contact an expert at Moore Insurance, visit http://mooreinsuranceteam.com/ or call (281) 367-8899.